I had no idea that a 40 pound puppy could make me, a grown woman, run away screaming for dear life, but she did – and she did it many, many times. In those first couple of weeks I learned a lot about how to make the biting stop, but more importantly I learned what not to do when they start coming at you with that mouthful of razor sharp enamel they call puppy teeth. So why did teaching Laika bite inhibition take so long? Because I was sending out a lot of mixed signals by yelping, running around like a madman and having a hard time being consistent. 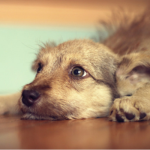 Here’s 5 things NOT to do when teaching your puppy not to bite. No one likes being bitten by those sharp little puppy teeth. I know it’s just a puppy and all, but they hurt much more than you’d expect. So naturally, when your puppy starts biting your hand or pants your first instinct is to get away. I mean if you put your hand on a hot stove you move it, that same principle applies to getting the hell away from whatever the hell is biting you. But be careful when it comes to how you decide to move away. Remain calm. Don’t flap your hands around in the air, scream and run away like a madman. I know you’ll want to – because it friggin hurts – but try your best to remain calm. You see when you run around like crazy trying to avoid a biting puppy that can send them into frenzy mode – and trust me you don’t want to get bit when they’re in frenzy mode. When you run away from a puppy while screaming or flapping around you’re going to look like a super fun toy to your pup. Dogs love to chase things, and that love is even stronger for exciting things – things that scream, flail around and move fast. Don’t turn yourself into a dog toy. When your puppy starts biting you try your best to remain calm. Remove yourself from the situation as calmly as possible to avoid stimulating them further. 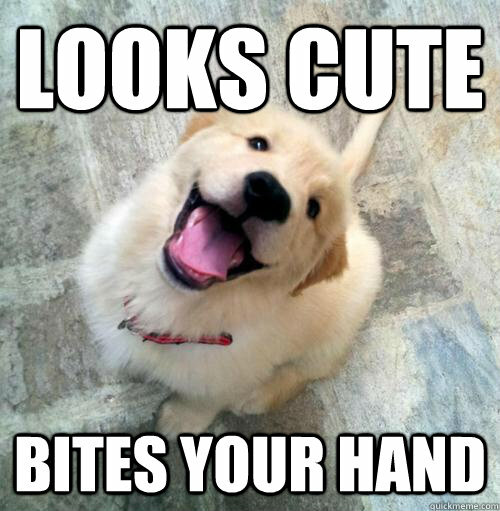 Conventional wisdom once told us that yelping at a puppy whose biting will make them stop. The yelping method is supposed to tell your puppy that ‘ow, that really hurts’ and then they’ll just miraculously cease biting. Well that doesn’t always work out so well, and can actually make them bite more. It certainly didn’t work for me, and if the comments on my Try Yelping They Said post are any indication it didn’t work for any of your either. Are us humans incapable of vocalizing a yelp of pain that resonates with puppy brains? Do our dogs know we’re faking it? My dog stops when she hears my real ow noises, but when I try to come up with a yelp she just looks at me like a giant chew toy. Honestly I don’t know why the yelping method doesn’t work for many dogs. I assume that the high pitched noise many of us making when we try to emulate yelping just excites puppies even more. What I do know is that when I tried it I instantly regretted it because my dog started biting me even harder. Puppies need stuff to chew on, and many of us do provide our pups with plenty of toys & chew toys to fill that need. But what we often forget to do is have them on hand at all times. Now I’m not saying you absolutely need to stash a bunch of toys in your pockets, but you should at least have a toy nearby for when the biting begins. When it comes to teaching your puppy not to bite it’s important to be prepared. And when I say be prepared I mean be armed with toys at all times if need be. I don’t know if Laika was the exception to the rule or if all pups are particularly nasty, but we had hundreds of ‘hurry up and put a toy in her mouth’ moments. After a couple of days I learned that having a toy nearby at all times really helps. When you’re playing with your puppy and they start to chew on your fingers (inevitable) hand them a fun toy instead. Now not all toys are extremely exciting to puppies, especially compared to wiggly fingers or toes. Make that toy just as exciting as your flesh by shaking it and moving it around. Remember you need to make their redirection target ( the toy ) more exciting than their fun squealing human target ( you ). Playing tug and wrestling with a puppy can be a lot of fun, but they can also lead to over stimulation. When puppies get super excited learning goes out the window. I rough house and play tug with Laika all the time; but when she was a puppy I had to really watch how excited she was getting during play. Before she had a good handle on basic bite inhibition those games were pretty much an invitation for her to go hog wild & bite anything in sight. I was setting her up for failure. There is no set rule on what games you can and cannot play with your pup. Interactive play like a game of tug can be an excellent way to teach your dog some manners and impulse control, but their little puppy brains can get over excited. And what happens to an excited puppy brain? Well they have a tendency to start biting. 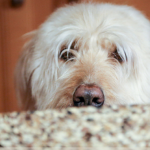 You know your dog best, and you’re the best judge of what’s too much when it comes to getting them riled up. If your puppy isn’t yet fully trained on not biting a game of tug might be too much. If you’re going to play tug with your puppy make sure you stay consistent with a set of rules. For me the biggest rule of all is ‘the game stops if your teeth touch my skin.’ And if your puppy seems unable to control himself ( and his teeth ) with a games of tug take a break and work on some more basic bite inhibition work. When it comes to teaching your dog not to bite it’s important to remain consistent. Many times the problem in consistency comes in when not all members of the family are on board. If you don’t want your puppy to bite it’s important to make it a set rule that applies to everyone. Your husband might be rough-housing and getting bit by baby Rover in the living room, but you don’t want that behavior to get transferred onto grandma. It’s a lot like teaching your dog not to beg for food. Once everyone is on board and refusing to give in it’s a lot easier to teach. One little slip up like but he looked so hungry, it was just a little piece of bacon will teach your dog that begging works, and he might as well keep doing it because the result will be yummy yummy bacon. Make sure everyone in the family knows that teaching your puppy not to bite is a priority. I know it’s funny to watch Sally get chased around by a little bitey puppy, but that’s not how you want your dog to act around grandma, the mailman or your neighbors. 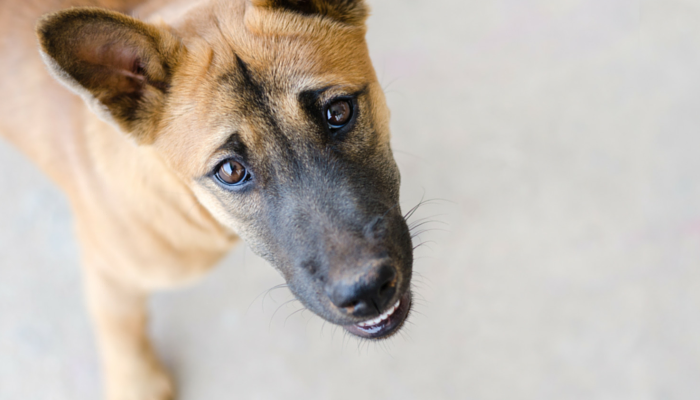 If you want your dog to learn to stop biting you need to be consistent. Everyone needs to be on board, and everyone needs to discourage biting by offering a toy instead. Every little slip up where the behavior is allowed ( or encouraged ) will lead to confusion when your dog is punished for it later. How Did You Teach Your Puppy Not to Bite? How did you teach your puppy not to bite? Did you use the redirection method with a fun toy? Did you try the yelping method with your dog? Did it work or just excite your dog even more? OMG – I’m the worst dog mom EVER!!! I totally did many of these things. Even today, I play chase and keep away from my dogs, I rough house with them, and I have been known to yelp when they bite too hard. It’s worked for me, but I can understand how it could have gone differently. Scout is very bitey during play and I’m okay with that – he understands “too hard” and “not so hard” and will settle down. He’s the only one who is bite; the rest of our dogs prefer tug of war. I rough house with Laika as well, and I play lots of chase games. I just wish I wouldn’t have done those things when Laika was a puppy because they were pretty much setting her up for failure by setting by getting her way too riled up before she learned the basics of what biting too hard meant. Madison is just starting to bite a bit, so this is an interesting post. I have always used the trading thing with a toy or chew and it works pretty well. Bailie and Madison get so very wild, I end up separating them several times a day as they are both over stimulated, and you are right, that is when Madison is also big into biting not only Bailie but me. A little time out in the kennel, and she is good to go again. Important information. The pictures you have in this post! So funny! Remy still bites me, softly thankfully, but he still does it when he’s excited, playing or even when he’s throwing a bit of a tantrum. Really the only thing that “works” for me with him is to truly walk away and ignore him or put him in his crate. I do try to hand him toys, sometimes that works too. I too zoomed in on the article. My husband’s 4lb Barracuda (Chihuahua) is now 6months old and a wild man! My husband ends up retreating to the couch, no feet on the floor when the biting gets too much. I get down on the floor & keep a constant flow of toys rotating to keep him interested. I am sporting “arm hickies” from quick piranha attacks tho. We haven’t had a puppy in 12 yrs, how long does this go on, lol?!?! Oh goodness it really is quite a shock after not having a puppy for awhile isn’t it? With Laika she got much better within 2 weeks, but it was probably a full month before her bite inhibition was really solid. During that time I ended up riling her up too many times to count and a lot of the previous training went out the window. Puppies need to receive your message that it is not okay to bite you and definitely not okay to bite you hard. Don’t send them mixed signals and do make a serious expression if they bite hard, laughing and screaming is not the way to go. They need something to chew on so why not providing them with some good chew toy? Just have it around you when playing with your puppy! The minute they start biting you don’t let them, instead offer them the toy and praise them for biting it. That way they will understand that their biting needs are not to be taken out on you but on the toys. And definitely don’t give them mixed signals.. They have the urge to bite and would love to do so, so if one family member allows them they will not forget about it so easily. Imagine if you were a child and wanted to go outside to play and one parent forbids it while the other allowed it. You would still kind of want to go outside, that’s how a puppy feels! I did bit inhibitation with my lab pup, and now she needs a toy in her mouth before playing with me, when there isnt a toy available she plays still but her heads moving to and away from my hand franticly trying to stop herself from biting me it looks like, I dont like that she has to rely on a toy to stop herself from biting, is there anything I can do to sort this? Is she still really young? My dog Laika struggled with bite inhibition until she was about 6 months old. She still had that strong desire to mouth everything, even after she learned not to bite our hands. We did this too and our dog does the same thing – she won’t play until she has a toy in her mouth. She is now almost 4. I am actually ashamed as I have done most of these things during the puppy training and actually got the instant karma. But it was my first experience and we are expecting 2 new puppies very soon in coming months. I am surely going to follow your tips to make the whole training process easy for myself and for the puppies. Thanks so much. And don’t worry, you’re not alone 🙂 I’ve done all of these things in the past (multiple times actually). I wish you the best of luck with your new pups. My sister just got an 8 week old Golden doodle and has 2 young boys (ages 2 and 4). Any advice on how to help the kids learn what to do when the puppy bites? They tell her no, but also rile her up at times with their own excitement/energy. What worked best for me was using the redirect method. Every time my dog got riled up, or when her teeth touched my skin I’d grab a toy and encourage her to play with that instead. I would caution though that the puppies aim isn’t going to be perfect yet – so using that method (especially with children) may end up with the puppy accidentally biting them and the toy at the same time. If possible I’d try to get the pup socialized with some other dogs. 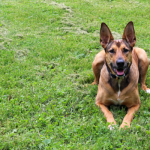 (a training or socialization class is a popular choice) Having other dogs teach the pup about bite inhibition will make your sister’s job easier. 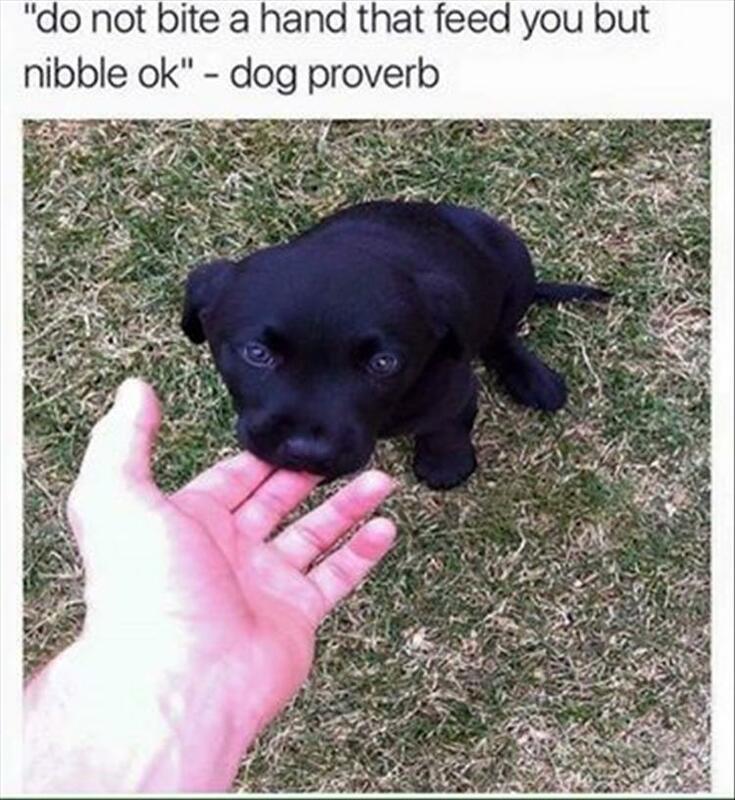 I’s also try to discourage rough play such as wrestling if possible (easier said than done, I know), at least until the puppy has a better grasp on some basic bite inhibition. I have a 10 week old puppy who just doesn’t want to listen to the word No! She shreds her puppy pads (not when she is alone but when we are there) like she is testing us. She bites so hard. A lot of the time it is to tell us that she wants to go to the toilet however she is constantly pulling at our trousers. It isn’t a nip but hard like she is asking for something but we have been through everything we can think of. I just got a maltepoo (maltese/poodle) about 2 days ago.. She’s 8 weeks old .. I did most of those specially the yelping and playing tug. She seems to get very excited or hyper. Right after playing she would turn to my ankles and bites hard. I tried the yelping, screaming “NO”, order her to sit, make no reaction and ignore her. Nothing worked, nothing, whatever I do seems to make the situation worse.. The worst part is that when she bites my mom or sister and they yelp or scream “NO” she stops immediately but with me she continues biting. I doubt that maybe because I get nervous or my energy is off that’s why she reacts that way .. I am the one training her, I mean I am her mommy. But obviously I am doing it wrong and I want to correct my method before it gets out of hand. The reason is because you are not dominant in your relationship with her. Maybe partially due to playing tug with her. That is a dominance game. If you don’t win every single time, when she wins she is gaining dominance over you in her mind. There are many ways to signal dominance to puppies. Look at how you are establishing dominance in your relationship for why hurting you does not matter to her. I just got a 10 week old Boston terrier puppy and he’s doing the same thing. It’s a relief to know that there are other people experiencing the same thing! It’s almost as if he wants to bite people more than his toys. It’s bad when he growls, bites us, and barks when we don’t respond. It seems like he’s playing, but it’s painful to experience and frustrating to try to stop. My friend gave me bitter apple spray and now when he begins biting I’ll spray it on. Y hands and touch his nose so he knows he doesn’t like the smell/taste. It works so well that sometimes all I have to do is pick up the bottle. This hasn’t worked fully, I want to get to the point where he knows not to bite people, but it’s helped in the moment! Hi, just curious if you think 9 months to start this type of training is too late? 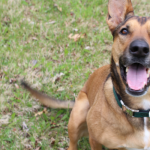 I also hear that dogs who’ve been taken away from their parents too early are also hard to train for this, which ours was, she’s a rot/Shepard mix. She is calm most of the time, but my mother seems to rile her up just by being seen sometimes, and she gets worse when my sister comes home from work. I watch her most of the time, since I work from home and usually during that time she’s calm. However if I’m playing with my nephews outside, she starts nipping and biting, it’s never been hard, but it’s been hard to deal with. It’s also not really an option to leave her alone anywhere inside due to her wanting to chew on things and she isn’t quite sure what’s okay to chew on yet, though that part is getting better. No I don’t think it’s too late to work on it, I was still working on it with Laika til she was about a year old whenever she’d get too riled up (maybe it’s a Shepherd/Rot mix thing since that’s what Laika is too 🙂 ). I’ve also heard that pups that were taken away too early from their parents can make bite inhibition harder. I think that’s definitely plausible considering dogs learn so much from one another, and playing around with siblings and parents is important when it comes to learning about what behaviors (such as biting too hard) aren’t tolerated. She sounds an awful lot like my dog Laika, and she was by far the hardest dog I’ve ever trained when it comes to bite inhibition. That excitability makes it really challenging and has a tendency to override their impulse control. If possible I’d try to bring a toy along when you’re playing with your nephews, that way if she starts to bite you can redirect her attention to a toy. Move it around, shake it, toss it – whatever you can do to make that toy more exciting than whoever she’s currently biting. It sounds like you’re making great progress so far. I have 8 week old pups that are terrors!! Foxhound/Pit/Bulldog (no, not on purpose). Mama is only 14 months old. She went into heat while we were on vacation and the sitter had no idea. Anyway, an oops, and my first experience raising puppies. I will add, first and LAST! I have asked friends, looked on the internet and read books. What works for me is to grab their little snout (firm, but not too hard), make sure you have direct eye contact with them, and with definite authority say NO! I have been working on this for about 3 days now, and it is WORKING!! They are home with me all day, no outside influence, so we have a schedule, we have discipline and we have FUN! Of course they are going to bite, but now all I have to do is say NO and they stop (for the most part). They are a handful, but worth it. I have had to say goodbye to all but 1 (there were 7 and all survived) and my heart has broken into a million pieces each time. I didn’t know this would be such a stressful, absolutely amazing experience. So glad I did it and I hope this helps someone out there. Hi! I stumbled upon this amazing blog after getting up to clean the soiled pee pads of two 6 weeks old lab-hound-unknown mixed foster puppies. They’re adorable but they bite everything, everything but their chew toys that I shake in front of them or offer them when they try to slice me open. (Seriously!!! Looks cute and bites so hard!!!!!!) I know they’re removed from their mother too early, a whole different story. However, I need to keep them and myself sane and healthy for a week before they go home. I will try these techniques. They are still too small to actually realize how hard they’re biting I guess. Also, did your puppy poop a lot?? It’s a gooey stinky poop, coming out like clockwork every 3 hours. Do you have some advice? Oh wow it sounds like you have your hands full; I couldn’t imagine trying to manage two pups (it was hard enough with one). As far as the poop goes no my dog didn’t poop all that often, usually just 2 times a day. But then again she was a bit older when we got her (probably about 16 weeks old), and I’m not quite sure what the “regular” amount would be for pups that young. I’m assuming they were weened recently, the transition to normal solid food may be upsetting their tummies — or they could have intestinal worms. Are you fostering them for a rescue? Do you know if they took them to the vet already? I’m no expert with super young pups, but I don’t think every 3 hours is normal. I’d probably take them into the vet if they haven’t been already. None of these seem to work. She just gets more agitated. I don’t know what else to try. Have you tried the redirection method where you hand her a toy or treat when she starts to get bitey? It takes a little while, but that’s the method that ended up working well for my dog. I have a 11 week old husky puppy, and wow does she bite a lot and hard. I’ve noticed she bites my boyfriend a lot more (I am doing all the training with her so she probably sees me as dominant) but still it’s an issue. I will try this out, as yelping only made her bite harder. She thinks biting us is more exciting since we react to it. It’s so hard not to, we both have scratches all over our arms. But I’m worried since shes going to get bigger, that she is getting too bitey and feisty with other dogs as well. I dont want to have to separate her from smaller dogs in the future because she doesnt know how to play gentler. I’ve been taking her to puppy play times and everything but I’ve noticed that older dogs just tolerate her bites because shes a puppy. 19 days ago I adopted a German Shepherd/Mastiff mix that just turned 11 months. The first day he grabbed my barefoot and held me in place when I got up to get my water. Telling him no didn’t work, so a I pried his mouth apart to get my foot out and he then latched on to my forearm, and I lost my temper then rolled him on his back and held him there for minutes. He yelped in frustration and holding him down was quite the challenge. Now 18 days later I realize that’s how he plays. When he gets overly excited he gets mouthy and it’s a habit I want to break him of, because even though he’s puppy, he looks like an enormous dog that’s capable of inflicting serious damage. And I would hate it if anyone who didn’t know him to think that he’s vicious. He truly is a kind soul with a mind of his own . With that being said, the only deterrent that seems to work is the toy distraction method. Everything else has been fruitless. In his short life, I am his 3rd owner. His first owner took really good care of him, but they just had a newborn baby and an elderly dog that couldn’t handle him, so they surrendered him to the Humane Society. His second owner adopted him and brought him back a couple weeks later, then I came along. Needless to say this dog has some quirks. He has serious separation anxiety and obviously he hasn’t truly bonded with a human before. How could he? With that being said, I refuse to give him up. If he were mouthy and vicious, then yeah, I would. I have a 3 year old niece that periodically stays at my house and she’s terrified of him, and yet he so gentle with her. She cries and screams when he’s near, and all he wants to do is lick her to calm her down. Anyone else have any useful tips how they broke their giant puppy from being mouthy? I ashamed to admit that I did smack him the first day when he wouldn’t let go, and I don’t like using violence on anything unless I feel I’m in harms way. Fear got the best of me on day one, and I want to be a better friend to him from here on out. Haha! 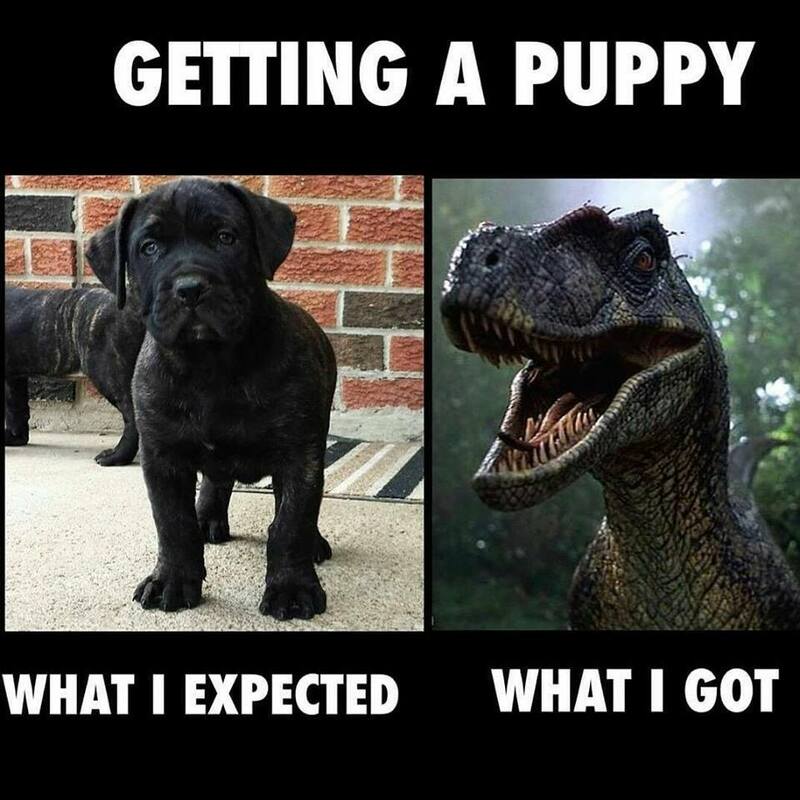 I love that “getting a puppy, what I got, what I expected” meme! It is so true! Who knew that their teeth could hurt so much?! Great ideas! To help train our dog, we would alpha her. This is something that dogs naturally do, especially mommy dogs, where we got to witness our dog being a mommy! Mommy dogs definitely let their pups know when they are getting out of control. Hey, we are trying to train a dog who isn’t really a tiny puppy anymore,,, he’s probably a couple of months old…but he still loves to bite! Not pulling away when he latches on and waiting til he drops doesn’t really work because he’s older and his teeth are SO sharp!! plus he kind of chomps whatever’s in there anyway. He only bites before he’s been fed or if he’s really energetic…not if its a warm day and he’s feeling lazy or if he’s just eaten. There’s so many ways out there that are supposed to work for teaching dog not to bite that i don’t know what to even try! I’m a bit confused as to whether he’s biting everyone because he’s still hungry, and isn’t being fed enough, or if it’s just a bite because he doesn’t know better.